They come in at $100,000 a pair. 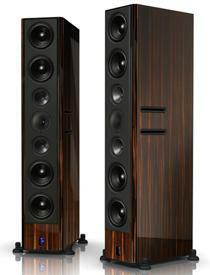 Also newly available are the company's 5.1 speakers, which sell for a more modest $45,000 a pair. The Lansche Audio No. 7 is a fantastic looking speaker. It stands just over 5-1/2 feet tall and comes in either a Satin, High Gloss or Piano Black Lacquer finish. Lanche's passive speakers offer a new version of the company's Corona Tweeter, which uses an electric arc that uses the air as a transmission medium. There's no dome - just electricity and air. Lansche says that this is the closest anyone has yet come to a zero mass sound source. The No. 7 also offers a pair of 4" mid-range drivers and four 8.7" woofers for bass response as low as 25Hz. You can pick it up now from Aaudio Imports of $100,000 a pair. The No. 5.1 three-way loudspeaker uses the same Corona Plasma Tweeter to provide the highs, but only utilizes one mid-range driver and two woofers. Despite having fewer bass speakers, it still gets you down to a frequency of 32Hz.